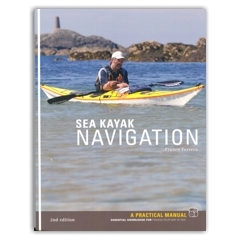 A concise manual of navigation aimed specifically at sea kayakers. Worth every penny for what it has to offer in terms of understanding tides. Ferrero, the author of The Seamanship Pocketbook, has an easy, enjoyable to read style that leaves you with a good understanding of the principles of navigation presented. However, it is an overview of sorts, maybe the least you should know but certainly more than most of us take time to digest on the subject. Filled with well-illustrated diagrams and good analogies to get his teaching across to the novice. In this respect the 2nd edition hasn’t changed from the 1st edition. The devil is, of course, in the detail. The author, Franco Ferrero, comments on his book Sea Kayak Navigation, the Black Art Demystified: "As a result of feedback from readers my views on what sea kayakers need to know and are likely to use has changed. I have added and expanded on topics where I have considered this desirable, but have taken great care to keep it as short and simple as possible. There is no need for a glossary as all the terms are explained in the book. To that end there is a comprehensive index. There are exercises suggested at the end of the chapters. Make use of them. They will ensure that what you have read is understood and remembered. The ultimate test of whether or not the lessons have been absorbed is the first time you plan and execute a trip relying on your own navigation. Take precautions; plan simple trips and aim for big targets to start with. Ask someone more experienced to check your calculations the first few times. Try and get someone else on the trip to plan it independently and compare your results. If they are reasonably close, carry on. If they disagree, start again! Always take into account the weather forecast, and base your planning on the abilities of the weakest members of your group. Build up slowly. Enjoy the book and enjoy your paddling." If out of stock please use this Amazon.com link to purchase.